We condole the sad demise of our founder publisher, Garikapati Muralidhar Sarma (April 2, 1936-Dec 18, 2017), the brain and the prime mover of Nartanam. I do not quote the great bard when I say that G.M.Sarma garu, as he was popularly known, was a man who was "born great" and also "achieved greatness"; Sarma was such. He was born with a suave and sensitive persona, which possessed an innate love for arts. He attained greatness with a finer sensibility of a connoisseur who served as an altruistic patron of Kuchipudi and dance at large. But his was an unsung greatness. You cannot find him on google and there is nothing written about him anywhere. He was a man not connected with dance in any way other than being an interested spectator. He retired as Joint Chief Controller of Explosives, Department of Explosives, Government of India. However, he was destined to come across guru Vempati Chinna Satyam's work and fall in love with Kuchipudi. After that, there was no stopping Sarma, who splurged money and effort, and passionately crafted some of the finest festivals and seminars of Kuchipudi (Kuchipudi Mahotsavs) and has left behind valuable archives apart from bringing Kuchipudi to limelight across India. However, he stood behind the scenes and shunned all publicity. His love for the great art of guru Vempati Chinna Satyam was legendary and he, as the Secretary of the Andhra Associations whichever city he served in, espoused the cause of the great guru and his art form. I often said to him that he was a devotee of guru Vempati Chinna Satyam just as Lord Hanuman was of Lord Rama. Every video we watched of the Kuchipudi Mahotsavs, Sarma garu would cry at the sight of Vempati. I do not quote Bertrand Russell when I say the "vagaries of human nature" are such that guru Chinna Satyam and his family was estranged from G.M.Sarma in his later days but his devotion for Chinna Satyam was unfaltering till his very end; human nature is capricious. He pined for Vempati Ravishankar, a bright star of Kuchipudi, wasted by illness, who probably never attained the heights he was destined for. The memory of a very ill G.M.Sarma standing for over thirty minutes at the steps of a stage in Hyderabad, supported by my husband to stand steady on his feet with his bouquet of flowers, wrenches my guts to this day. The people on the stage whom Sarma garu had backed his entire life did not even have the courtesy of accepting the old man's bouquet of flowers. No matter, Sarma garu never bore a grudge. The money he showered to sponsor Kuchipudi programs was hard earned but he was rewarded with suspicion and disrespect in the end. I call this the "Kuchipudi Syndrome" which the entire community of traditional Kuchipudi families is blessed with: "Suspect friends and be manipulated by the wily and ruin their own community of boundless talent, devoid of vision, with petty squabbles and ego." I came across G.M.Sarma years ago when he called our home out of the blue and introduced himself to my husband and announced unabashedly his intention of a dogged pursuit of drawing me to dance writing. He pursued me relentlessly till I agreed to accompany him to Kuchipudi for a festival and start writing thereafter. For some unexplained reason he placed great faith in me and egged me on to take over Nartanam's responsibilities as and when they arose and were thrust on me by the old guard. His pride in my work was worth all the hardship that Nartanam flung at my way. He was never the quintessential boss; he gave a democratic platform to air my views and would be sportive in our intense debates, arguments and disagreements at Nartanam. He would be graceful in conceding a point to a veritable greenhorn like me, much his junior. The many hours and days spent with him remind me of the pride, which would swell his heart, and fill his eyes with tears after every issue of Nartanam came out of the press. Ambitious, as Sarma was for the propagation of Kuchipudi, he envisaged a journal devoted only to Kuchipudi, which eventually was destined to start as a journal providing a platform for academic writing on all forms of Indian dance and reviewing it. 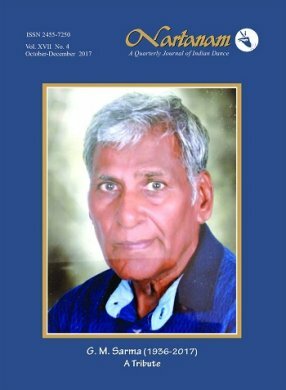 An article in this issue, written by G.M.Sarma himself, which is being reproduced from Nartanam Volume 12 no.3, gives an insight into his journey of service to Kuchipudi. It is poignant and even cruel, as the people who have walked with him in the field of dance and who have spoken volumes about his life and service have not responded to our call to pay tribute to him in print. Lip service is easy and hence he received it in plenty. I do not quote Tennyson when I say G.M.Sarma often expressed his agony, which reflected that the field of arts is "red in tooth and claw"; it is the prevailing law in arts in India. So vexed was he with dance and the dancers towards his last days; with dance, for its falling standards and with dancers, for their aggressive ways; he would cringe at the mention of the word "dance." The service to arts gave him profound joy but along with it came disillusionment with the baser truth of arts and artists. Some friends who have shared his journey in the field of dance have sent in their tributes. They are printed in this issue. We have chosen to highlight in this issue the recent documentation of Kuchipudi Yakshaganas held from 23-29 February 2016 at the Kuchipudi village in collaboration with the Sangeet Natak Akademi, New Delhi and the Government of Andhra Pradesh; and the Nartanam Conclave held from 5-8 October 2017 with support from the Government of Telangana. These were the kind of projects which were close to his heart. The historic Seminars on Kuchipudi and the Kuchipudi Mahotsavs organized by him in 1986, 1987, 1989, 1993, 1996, 1998, 1999 and 2001 were all time classics. The souvenirs released at each of the Mahotsavs are valuable documents on Kuchipudi. The Kuchipudi Kala Kendra, Mumbai, of which Sarma was the Managing Trustee opened three Kuchipudi schools in Mumbai, Kolkata and Nagpur, which produced talented dancers under the tutelage of Vempati's disciples who taught at the schools. The famed Kuchipudi Kala Kendra, Mumbai, published Nartanam before it was taken over by the Sahrdaya Arts Trust, Hyderabad. We salute our late founder G.M.Sarma. Madhavi Puranam is the Chief Editor of Nartanam. A trained Kuchipudi dancer, she has postgraduate degrees in Business Administration, and Performing Arts. Her book, An Indian Analysis of Aesthetics: The Dance, the Dancer and the Spectator with a foreword by Kapila Vatsyayan, was published in 2015 by Abhinav Publications, New Delhi. She is currently working on a book on Arts Management in India.